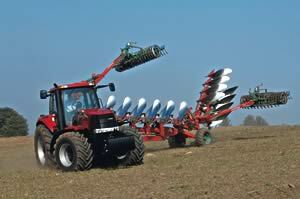 CASE IH will be presenting a range of innovations and new developments at the EIMA 2008 show. The focus of these innovations is on the optimisation of machine efficiency and fuel saving. In addition to new tractor models, the new Axial-Flow 20 and 88 series combines will be on display in Bologna; their first appearance at a European agricultural trade show. The focal point of CASE IH stand will be the world premiere of new PUMA CVX. The new range has been developed from the highly regarded PUMA range, now equipped with a continuously variable transmission and an engine power boosted up to 251hp maximum. The new series comprises two models: the PUMA 225 CVX (165 kW/224 hp) and the PUMA 210 CVX (157 kW/213 hp). The new PUMA CVX series boasts more than just the latest generation of continuously variable transmission technology. The PUMA CVX also features a newly-developed control concept, the latest version of the Multicontroller and a wide range of innovative technology to ensure operators remain focused and productive. Also making its first appearance at Bologna, the 2009 version of the large MAGNUM tractor series will feature a new suspended front axle. Providing more than provide extra comfort, the system also improves traction in all operating conditions. In the face of increasing energy prices, the efficiency of machines and low running costs for tractors play a much more important role than ever before. To meet these requirements CASE IH now offers Automatic Productivity Management (APM) for the MAGNUM tractor series. CASE IH is the first manufacturer to offer APM for tractors with Full-Powershift transmissions. Depending on the load situation, the system reduces fuel consumption by up to 24 percent compared to tractors of similar power without APM. The STEIGER 485 features a 12.9 litre Cursor engine with Turbo Compound Technology. This system passes the exhaust through a second turbine after the turbocharger. The energy generated by this turbine is transferred via a reduction gear and Voith hydro-clutch directly to the crankshaft, giving a considerable boost to engine performance and fuel efficiency. Performance is increased by eight percent at the same fuel consumption. With this system the STEIGER 485 has a unit fuel consumption of 195 g/kWh, making it the current most fuel-efficient tractor in the world! The new Axial-Flow 20 Series, consisting of three models: 7120 (maximum power 30 kW/422 hp), 8120 (maximum power 345 kW/469 hp) and the new 9120 (maximum power 390 kW/530 hp), the latest flagship model. There are also three models in the new Axial-Flow 88 Series providing an ideal breadth of capacity in the mid-range sector. The AF 5088 and AF 6088 models are both driven by an electronic-controlled 8.3 litre engine delivering a maximum output power of 216 kW/294 hp on the 5088 and 246 kW/335 hp on the 6088. The AF 7088 is new to the range, powered by a 9.0 litre engine delivering a maximum power of 269 kW/366 hp.